Which mail order store is an expert in delivering cheap HP CM4730fsk toner cartridges? One of our central beliefs is to only ever supply laser toners that are the very best quality for your printer. Pick Cartridge Save and get a extensive catalogue of cheap laser printer cartridges for the CM4730-fsk printer! Right now in Cartridge Save you will receive completely free delivery with every purchase, irrespective of what you have bought. We pride ourselves on that 98% of all orders placed with us will be delivered . So we can provide you lots more assurance, every HP CM4730fsk toner cartridge you purchase on our store will also feature a comprehensive thirty day money back pledge. Spend less cash with Cartridge Save. The professional HP Colour LaserJet CM4730fsk is favoured by offices as it has a high monthly duty cycle and excellent features. The HP Colour LaserJet CM4730fsk multifunction laser printer can also scan, copy, and fax and has a stapler and stacker accessory and output accessory bridge. Print speeds can go as fast as 30 ppm for both monochrome and coloured prints, and the maximum resolution is 600 x 600 dpi. The HP Colour LaserJet CM4730fsk could have been better if it had standard Wi-Fi instead of just Ethernet. The sleek HP CM4730fsk Colour LaserJet comes in grey colour. The HP CM4730fsk multifunction printer model has a base with the paper trays and wheels. On top of the printer, there is a flatbed scanner and a control panel with easy-to-use buttons. For the convenience of users, an automatic document feeder and automatic duplexer are also available. The HP Colour LaserJet CM4730fsk printer has a monthly duty cycle of 175,000 sheets and it can handle 1600 sheets at a time. 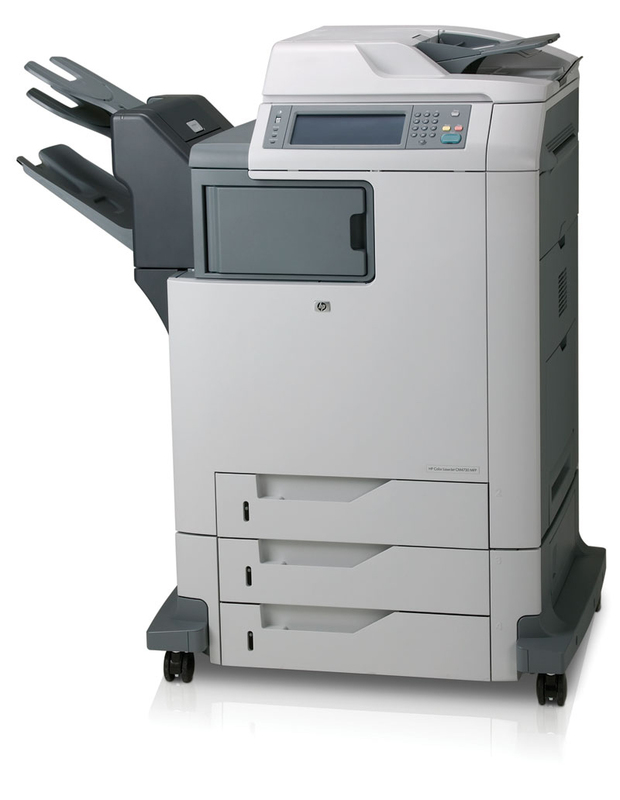 To save time and space in the office, the HP Colour LaserJet CM4730fsk is a good choice for a multifunction printer. With impressive print speeds of 30ppm in black or colour, the Colour LaserJet CM4730fsk is a productive printer for any office setting. The HP CM4730fsk colour laser printer has built-in Ethernet to make it easy for networking plus offers a USB and parallel port that are compatible with Macintosh and Windows computers. There are a small selection of multifunction printers that can do more than the HP Colour LaserJet CM4730fsk but these are few and far between. Some have built-in Wi-Fi and convenient features such as memory card readers and more USB slots but all in all the HP Colour LaserJet CM-4730fsk is a top quality Hewlett Packard printer which is hard to fault.